There’s so much smoke about an upcoming iPhone 6 with a larger, 4.7” display (and another one to follow soon after, with a 5.5” display), that there must be fire. 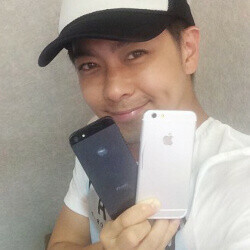 These latest images of Apple’s new iPhone darling have surfaced in China, adding even more to that thick cloud of smoke, and this time, they are coming from Taiwanese celebrity Jimmy Lin, the same man who also showed a pre-release iPhone 5 to the world earlier. In the images, you can clearly see a larger-than-before iPhone 6 portrayed alongside the 4-inch iPhone 5. The new iPhone also has different, much more iPad mini-inspired looks - with curvier edges, similarly styled speaker and overall form. Two very noticeable strips of plastic with a contrasting white color appear on the top and bottom, and are likely there to help with reception. Apart from that, Jimmy Lin who published the image, shared his first-hand experience, noticing that the iPhone 6 indeed rocks a 4.7” display, but has a good grip; it has the power button on the right side, and no built-in antenna outside. Along with those images, another batch of leaks shows just the aluminum shell of the upcoming iPhone 6. Take a look at them all right below, and feel free to share your opinions about this new style: do you like it? Damn ugly, there is just no excuse for that look. I hope this is not the final design because I think that the side-bezels are still too large. If Apple works for years on a design, one can expect more --> thinner side-bezels. Top and buttom bezels are alright from my point of view. I think it is fake. Have a closer look at the edges of the screen panel where it is about to touch the corpus. It looks like a plastic attachment scaled to fit the "phone's" corpus. That is not the real deal. They don't work for years on a design. They wait until other companies make a nice design, plop that into an iPhone, make the screen half the size, and then later sue the companies they copied. That dude is a apple's factory worker. And iPhone 10,000,000,000s will have same design language. That's my prediction. Note it. Come on! Put some pretty girls holding the iPhone! At least something to look at. oh, I get it you mean the guy. Sorry, HTC. You weren't doing so well, and now Apple is going to sue you. Apple copied the Samsung f700, and now they sue Sammy about once a month. If Apple copies HTC, then Apple would sue HTC, and there goes HTC. That's a bummer, because HTC's actually pretty good with Sense UI and the M8. yet still huge bezels, compare it to other 4.7" phones (Moto X, G2 Mini). The top and the bottom ones are still there not that it matters, I never really had a problem with bezels, they are all pretty small these days.